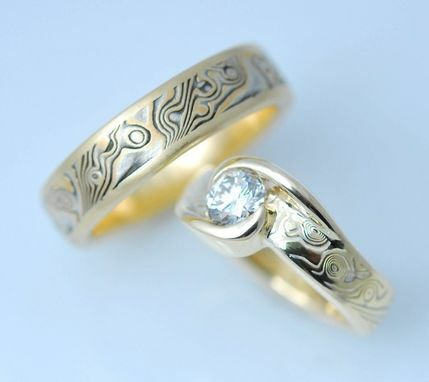 18k Yellow Gold layered with Sterling Silver Mokume Gane two ring Wedding Ring Set. This style is created with a 14k Yellow gold lining and setting around the stone. 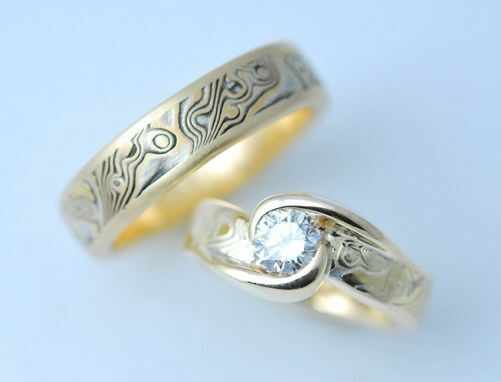 Since this set is made to order, it can be created in White gold as well. The Women's Mokume Gane ring is approximately 5mm in width, but width will vary with the size stone that will be used. The men's band is 6mm wide with 4mm of Mokume and 1mm sides framing the mokume. Delivery time is 3-4 weeks from time of payment. Patterns do vary so your rings will be truly unique.